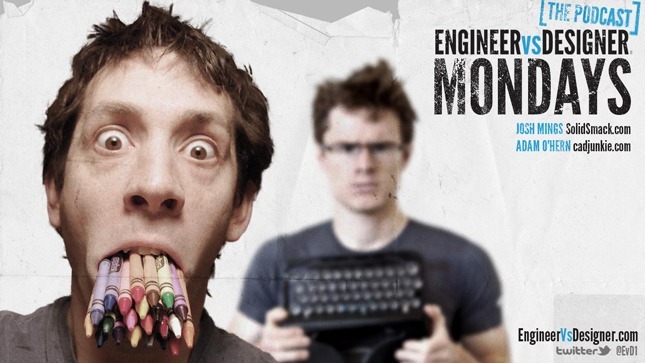 Engineer vs. Designer… The Podcast. I think you know what would happen if you locked an engineer and designer in a room together at the same time with nothing more than a microphone and some bluesy background music. Yeah… they would lock eyes, squeeze their bowels and proceed to have an insightful conversation about design, engineering and other CAD related topics. Aaaaaaand, that’s exactly what has happened. It also turns out that I, Josh Mings, am one of the people stuck inside that room. The other is Adam OHern, industrial designer and purveyor of fine tips and tricks at CADjunkie.com. We’ve teamed up to bring you the first podcast of its kind, delivering CAD industry news and analysis, tips, tricks, Q&A and a special guest EACH Monday! It’s Engineer vs. Designer and it starts, today. How did it start? Well, I’d like to say it was birthed out of the blood and sweat of a heated debate about popcorn makers, but that’s not the case. It actually happens that we were bored and needed another project to consume that last bit of positive energy we had. Believe me, making a podcast and launching a site around it is a perfect way to have your energy, nerves and a few layers of skin consumed in the shortest period of time. Thing is, we LOVE IT, and hope it shows in our very first podcast episode. Now remember, this is our first foray into podcasts, so be gentle. Check it out and let us know what you think or what you’d like to see.